Enjoy Michelin star Japanese cuisine with Geisha performance in Tokyo. Luxury vehicle and professional guide will pick you up from your staying hotel, and return way is also included. A place with over 100 years of history. The Nihonbashi Ningyocho area is a place where there are remembrance of the Edo period. 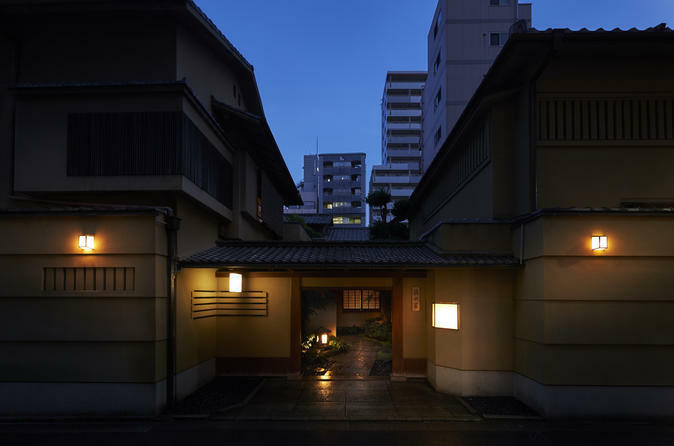 After the war the restaurant was rebuilt, the building itself is rare in Tokyo that incorporates the Sukiya-zukuri style (Architectural style based on the style of a Japanese tea ceremony building). The Sukiya-zukuri style finds beauty in simple modeling. You will find the room to be cozy with the scent of the wood and tatami that envelopes the room. This restaurant got Michelin 3 stars on 2007, and it was first 3 stars for Japanese Kaiseki restaurant. Inside the restaurant there are hanging scrolls and flower arrangements that depicts the seasons. Outside you can enjoy the view of the Japanese garden which changes from season to season. And in the room everything is prepared to welcome you. The owner of the Geyadana Hamayada wishes to serve a dish that leaves an impression to the customers heart by using the ingredients from the 4 seasons, mountains, and the sea which has blessed upon us. You will find the elegance of the dish from the master chefs who carefully picks out the tableware and the dish that matches with it. By utilizing the ingredients to the fullest you will get a sense of the seasons with every bite you take. While you dine you will have a fist class Geisha performed before your very eyes. You will be able to not only enjoy the fine dining but you can only enjoy Japanese tradition and culture by the Geisha who will be dancing while being accompanied by music played by a shamisen (Japanese style banjo-like three stringed instrument played with a plectrum).